We've been experiencing strange things happen in the house lately like oven turning on by itself, volume on TV steadily raising without anyone touching the remote, AC turning on, feelings of dread and negativity filling the air and a real sense of uncomfortable air when alone in the house. 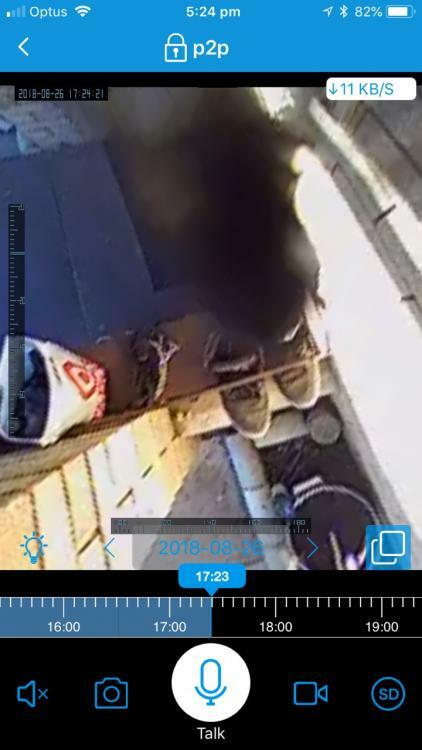 Just a few months ago I captured this on the CCTV outside the house. Once I have seen a black figure standing on the driveway but never saw anything on our cameras until now. What is it? What should we do? Hi the picture shows a pair of work boots and other bits and an out of focus image of what looks like possibly a black cat running across. Hence if its moving, its blurred on the picture. As for your electrics, you need to get them checked, you could have a fault in your electrics. Get your appliances checked out, a faulty switch on the oven could cause a house fire. Tv volume going up could be a side effect of someone else's remote. AC units typically have settings were they kick on when it get's to cold/hot. feelings of dread and negativity filling the air and a real sense of uncomfortable air when alone in the house. These are subjective and based on belief that something "spooky" is going on. Looks like a bug of some kind, right on the camera lens. Get your electronics checked out, quit worrying about some spirit, same goes for the camera image unless you've got a very clear picture of someone you don't know. Looks like a bug on your lens. Sounds like it could be a cluster of paranormal activity. I'm not sure 'poltergeist' is the right word though. Anyone you can turn to for advice like a priest or pastor or someone you respect with a knowledge in these things. Also on-line you can find 'banishing' techniques but I am not an expert in that. Good Luck. Also most of the respondents on this forum do not believe in the possibility of the paranormal period. I do believe it's possible and is not all that rare in this world from all I've heard. I am sure you consider the reasonableness of normal explanations too. Looks like focus blur rather than motion blur. Bug on lens. BTW, what kind of CCTV lens is it (brand/model), and why is it pointed that way? An image of the same scene when nothing was there (same time of day and same weather, please) might help, but frankly .. bug. As for the rest, I'll guess that your remotes are being affected by spurious IR (common in sunny rooms) or a failing IR sensor (my AC does that), or that a family member / neighbour is messing with you. I highly doubt a neighbour would have time to play games, my guess is that is an unknown apparition. Everyone talking about it being a fly and about the electrical being bad I the house. I fill you all in on a few more details. - Dad is an electrical engineer and so everyone is 100% sure that none of this is because of an electrical fault. Especially since the oven is not an electric oven, it's gas! So how do you press in the knob to let out gas, twist to ignite and then turn to set the degrees to maximum when there is "nobody" else in the house but me? - A friend and his fiance house sitted for us a few years ago while we were on holiday and he called me one morning frantically upset and crying. He said that his fiance collapsed in the hall way and wasn't responding. When she finally woke up she said she saw a ghost of a young girl and a dark shadow behind the girl and that's the last thing she remembers. They both to this day refuse to come back to my parents place. - Our dog will refuse to enter this hallway at all costs and will always run past with her head down if she needs to walk past. - One time we were doing renovations to the bathroom and replaced the large wall mirror, my mum started screaming from the lounge room and we all heard what sounded like glass or tiles breaking and ran out to see mum. She said that the floor tiles were being moved and smashed like someone was lifting them off the ground. The tiles were untouched when we came out. Wow, talk about ignoring all the issues raised. Just on one topic alone - you came home to a gas oven at full power and didn't report it to authorities or at the very least get a full report from a gas fitter? That could be deadly, not just for you but for everyone living near you - did you not think that it could easily have started a fire? Regardless of all that - it's still just a bug on the lens in that pic. LOL before you jump and assume nothing was checked, OF COURSE we got someone to check. And besides it doesnt matter if it's a gas leak. Why? Because you have to ignite it by pushing and turning. For a paranormal advice site, you should probably not be on here giving any. This isn't a "paranormal advice" site. Not like a gas leak can kill you. No, why worry about that. You guys are idiots, there was no gas leak. There was no gas being expelled into the air. The gas turned on yes but it was contained in the oven. The gas and oven were checked to have no faults. Get over it lol. I did have last night's pizza reheated though. It's a bug on your lens you can even see it's legs. You ask questions and you've gotten answers. Maybe your place won't burn down and maybe you won't die from gas fumes. If you don't care then don't comment fool. Name calling is usually a good indication of a liar. In which context does name calling automatically indicate a liar? You sound like a 10 year old, you need to really grow up and move on because you've already mentioned that you personally don't care, yet you're still here commenting? When someone new comes in, starts name-calling, getting immediately defensive and needlessly rude and insulting like you, yes it usually means they are hiding something that comes out later. This happens all the time. People who come here that truly want help don't act like that. When someone new comes in, starts name-calling, getting immediately defensive and needlessly rude like you, yes it usually means they are hiding something that comes out later. No it was you being rude, completely disregarding my story and what I had to say. Also other members being sarcastic and condescending by implying I was an idiot and not thinking a gas leak could cause serious injury. I call a spade a spade, I dont beat around the bush. This is how I would deal with someone like you in real life, in person if you were being condescending. I'll point out again, if you don't care. Please stop commenting on my post and find another one to waste your time on. You're starting to sound desperate. I'm interested to hear what makes you think that picture isn't of a bug. It's pulled from a video, let's see the video. It's the only evidence we have that isn't heresay, so I can only focus on that. I found @sau_33 of perfectly normal demeanor until the usual crowd insisted he had nothing paranormal going on (the same insistence given every OP here from the same crowd).